Posted December 7th, 2018 | News, Regulations. As part of Soundcraft’s continuing commitment to uphold our Secured by Design (SBD) licence, we ensure that products undergo the rigorous testing required to meet specifications outlined by SBD – the official UK Police flagship initiative. SBD’s principles of ‘designing out crime’ requires annual audits and product-testing to improve security in the built environment. We are proud to announce that all Soundcraft tests were once again successfully passed to secure the Q Mark PAS24:2016 certification and retain our ongoing SBD license. The tests, undertaken by the independent body Exova of a window and door from the Senior Architectural Systems (SAS) range, achieved standards for certification of security suitable for dwellings and other buildings exposed to comparable risks. 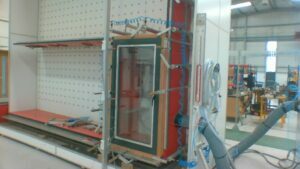 A further weather tightness test was also carried out on a window from the SAS PURe range, which also passed to classify that the windows are manufactured to the correct standard. 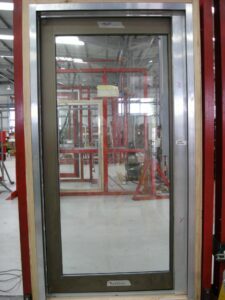 A glazing removal and infill manual attack test, during which screwdrivers and craft knives are used in attempts to remove the glazing or infill panel. Mechanical loading tests, where 3kN is applied to all locking and hinge points via a pneumatic ram without entry being achieved. Test for air permeability, whereby air leakage is measured at pressures from 50Pa up to 600Pa. A water tightness test applies 15 minutes of increasing water pressure of up to 600Pa.